Today's gallery looking back at the 2016 ITU World Triathlon Championships in Cozumel, Mexico, reflects the (typically self-induced!) 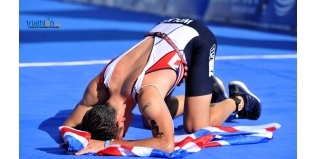 pain that we often put ourselves through in triathlon. Once again, I've compiled this varied selection from the archives of the ITU's great photography team of Delly Carr and Janos M. Schmidt. The sweltering heat was pretty tough for the extensive GB Age-Group team in Cozumel. It wasn't easy for the home athletes either! World Under-23 Championship glory for Jorik Van Egdom - but it hurt. Sixth place for Cesar Saracho (MEX) in the Men's Under-23 division. Three World Championships in a row for Laura Lindemann (GER) - but this one was not easy. ...something this Mexican athlete would agree with. Is this a pain face from Vicky Holland? We're not sure - but we liked it. This Aussie has given his all in the Age-Group race. The officials and support staff did a great job and were busy all week. Pictures like this one made news all over the world. Jonathan wasn't the only Elite athlete that wanted to lay on the blue carpet as well as run on it.